RT spoke with several political analysts to get their views on the Democratic and Republican primaries for the US presidential nominations, a process that has no shortage of money and mud-slinging. 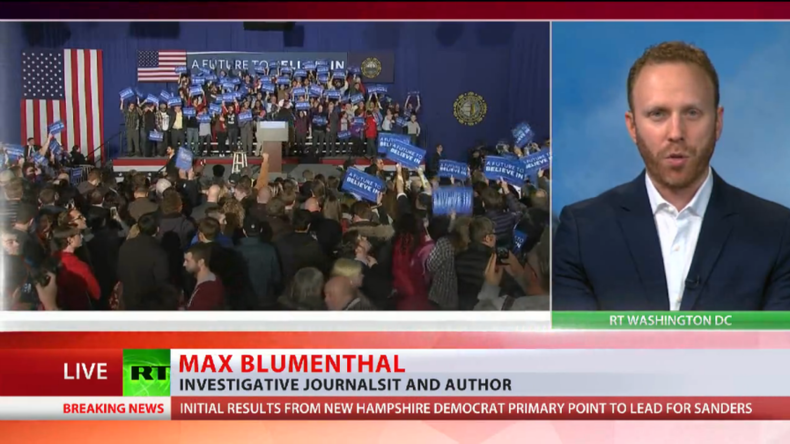 Max Blumenthal, investigative journalist: Bernie Sanders demolished Hillary Clinton among younger voters, but he demolished her among every demographic group in New Hampshire - including independents and gun owners. The only group that Clinton won with was people who make over $200,000. Let me just make a point: In 1994, Bill Clinton, president at that time, leader of the Democratic establishment rammed a bill through Congress to pass the North American Free Trade Agreement with support from the Republicans and almost overnight more than 26,000 manufacturing jobs were lost in New Hampshire alone. And George W. Bush comes into office, head of the Republican establishment, continues to pass free trade agreements and pass policies that shafted the working class, blue-collar voters in New Hampshire. Donald Trump and Bernie Sanders both campaigned against these free trade agreements; they both called for increasing manufacturing jobs in America and I think that’s a huge factor in why these two figures triumphed in New Hampshire. And we are not really hearing that from the mainstream American press who remind me of kind of like, if you watch CNN right now, postmodern aristocrats in a protected Elysium talking about a peasant revolt down on Earth. They kind of can’t believe what’s happening. 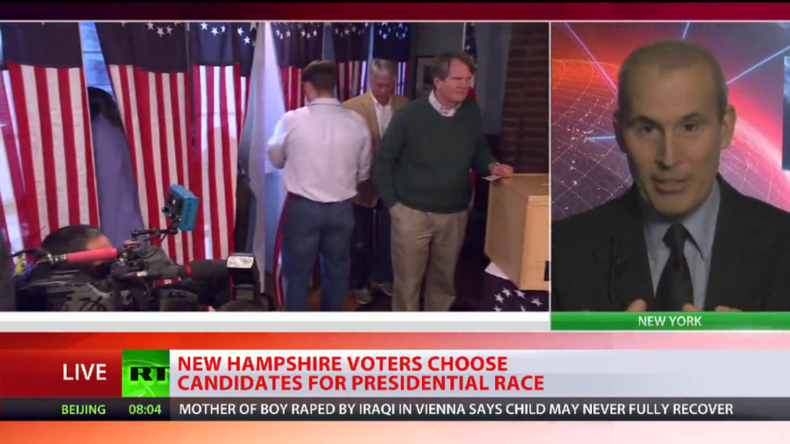 As far as what New Hampshire actually means in the total scope of the election, it is pretty symbolic. Because when Bernie Sanders entered the race, he was losing to Hillary Clinton by as much as 40-60 points. But this has been a real turn around for his campaign and it is surprising to see him make this much progress. 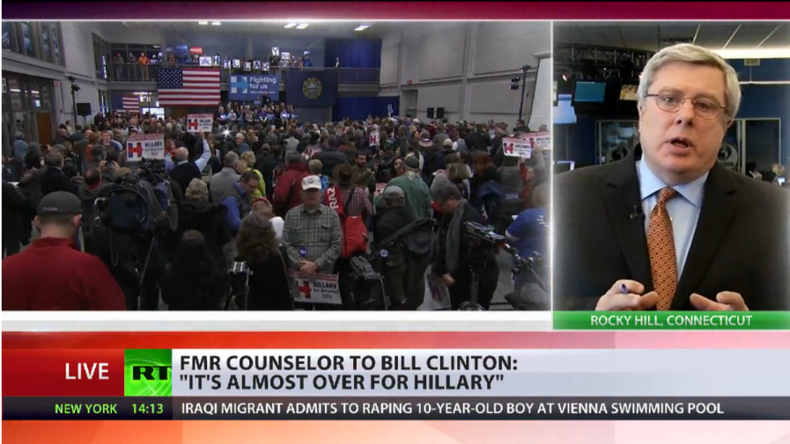 - Andrew Joyce covers US elections 2016 for The Fusion, former producer at MSNBC. For the first time, I think the mainstream media in the US, the cable news, will have to cover Bernie Sanders. We have to remember, even though Sanders triumphed by some 18 points in New Hampshire and tied Clinton in Iowa, he was doing so with an almost a total blackout in mainstream media, so that’s going to change enormously and his pitch to African-American voters who have this long standing relationship with the Clintons in South Carolina and Latino voters in Nevada is that the more they get to know him, the more they will like him. So, that will change the dynamic somewhat. The Clinton campaign is completely banking on South Carolina and Nevada as the place where they will write Sanders’ epitaph. "We tend so often to personalize politics. My personal feelings about Hillary Clinton are nothing much other than respect and affection. She is an extraordinarily impressive person, even more so up close. My differences with her and what would prevent me from being able to support her are that I believe that she is too close to Wall Street and has been too much a part of the political system here; people sometimes call it ‘soft corruption,’ which has mortgaged both political parties to the most powerful corporate interests. And I believe that she is too readily inclined toward military internationalist strategies abroad. Those are real deciding issues for me. And so with much regret and feeling always much gratitude toward the Clintons for the time I have spent with them and respect for them, I think it is time to move on." "There has never been a Republican or, to my knowledge, even a Democrat who has come in worse than second place in a real contested New Hampshire primary who has then gone on to win. So, it is influential, you don’t have to win but there is simply not a great track record for people who came in third or fourth or fifth to all of a sudden start with momentum. So, the pressure is really on for this bunch of candidates, these five that are bunched up behind Donald Trump to come in second place, because if they don’t the pressure mounts for them to get out of the race. The pressure is on their funders where they say: 'We are taking back our money or not giving you anymore.' So these candidates are going to start having to produce. It is not enough to simply show up and spout off at the debates. If you consistently can’t come in first or second, people are going to try to push you out the door. The problem for Bernie Sanders is that New Hampshire is almost uniquely suitable for him: it is right next to his neighboring state, it is fairly white, it is fairly affluent, it is an ideal state for him. South Carolina is not: it is more southern, a lot more African-Americans there, so that is what the Clinton camp is banking on… Bernie Sanders has exceeded expectations all along the way".